There are many JKA members through all over the world who experience some difficulties within existing karate organizations. Some of them found their way in splitting and joining different shotokan groups. We are a group of JKA black belts in Belarus who are worried about this fact. Instead of creating a new split we have found our own way within the JKA. 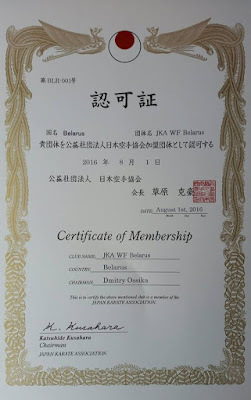 We asked the assistance of Masao Kawasoe Sensei (JKA/WF) and applied for individual and group membership in JKA/WF. In June 2015 in Tokyo we had a brief meeting with Toshihiro Mori Shihan (JKA HQ Executive director) who promised his full-backing and to whom we express here all our gratitude. In 2016 we became members of the Japan Karate Association, the largest and most prestigious karate-do organization in the world. At the moment we are ready to make every effort to develop our group under guidance of the JKA. 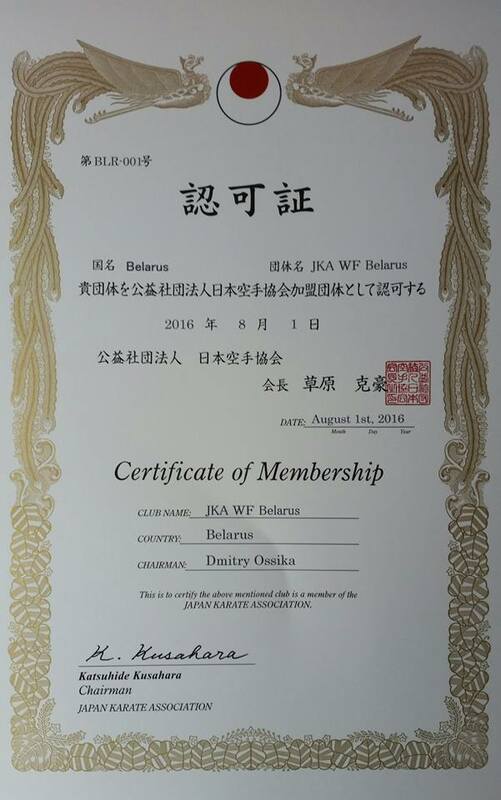 JKA/WF Belarus is a group of instructors and students 100% loyal to the JKA, who want to study freely in the proper JKA tradition and maintain their roots based in Japan.